The Los Angeles Philharmonic, rightfully so, is celebrated for its commitment to new music, both the pieces performed and even more for the pieces it commissions each season (next season the Phil will offer 23 commissions, 22 world premieres, six U.S. premieres and two west coast premieres). 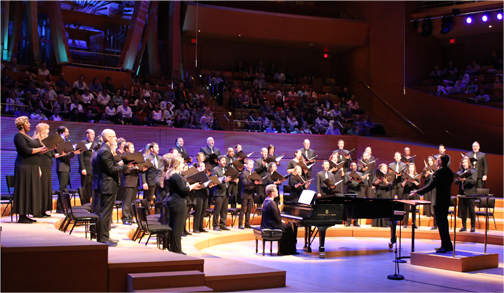 However, many of the finest new compositions are in the realm of choral music and nobody celebrates this music joyously as Artistic Director Grant Gershon and the Los Angeles Master Chorale, which closed its 53rd season yesterday at Walt Disney Concert Hall with a concert of works written within the past 20 years. If the Chorale’s splendid performance of Morten Lauridsen’s Lux Aeterna was the afternoon’s highlight (I’ll discuss it in a few paragraphs from now) then the revelations were the seven a cappella pieces written by five composers integrally linked to the Master Chorale. All of the composers either studied or were otherwise influenced by Lauridsen, who has been a professor of music at the USC Thornton School of Music for more than 50 years but always reserves the summer to do his composing on an isolated retreat in the San Juan Islands outside of Washington. Several of the works chosen yesterday played off of themes expressed in Lux Aeterna: hope, illumination and reassurance. The most moving work was Angel Band, part of Heavenly Home: Three American Songs, by Shawn Kirchner, a member of the choir’s tenor section, who served for three years as Master Chorale Composer in Residence (as did Lauridsen before him). The choir’s intonation of the moving Angel Band text was mesmerizing and Grant Gershon segued without pause into a rollicking version of Unclouded Day (although I’m not sure that a day without puffy clouds would be my idea of paradise). Two of the pre-intermission works were world premieres: In Gratitude by Billy Childs, which the choir sang with diction so precise that the supertitles were not needed; and Time in Our Voices by Moira Smiley, which grew out of the Chorale’s Oratorio Project at Van Nuys High School (REVIEW LINK) and was conducted expertly by Assistant Conductor Jenny Wong. The concert opened with Iri Da Iri, a work with slowly shifting chords that former L.A. Phil Music Director Esa-Pekka Salonen wrote on a commission from the Master Chorale members for the ensemble’s 50th anniversary in 2014. Current LAMC Composer in Residence Eric Whitacre conducted the west coast premiere of I Fall, a piece with texts by Charles Anthony Silvestri that came 12 years after his wife’s untimely death. It’s a melancholy work that the Chorale sang with elegance. The piece will be part of an evening-long work Whitacre expects to complete next year entitled The Sacred Veil. When Lux Aeterna was premiered by the Master Chorale on April 13, 1997 in the Dorothy Chandler Pavilion, I was in attendance. I’ve since heard it many times and sung it several more. My opinion hasn’t changed since that first hearing: it’s one of the landmark compositions of the late 20th century. It’s also one of the most popular major choral pieces right now; the composer’s publishes says that the choral/orchestra version is performed about 50 times per year in the U.S. That doesn’t count the organ/choral version performances nor concerts outside the U.S., nor does it count the numerous church choirs who have the work’s third movement, O Nata Lux, in their libraries. Lauridsen wrote Lux Aeterna for the Chorale’s makeup at the time. Prior to Lux Aeterna he had written another landmark piece, O Magnum Mysterium, for the Chorale and Lux Aeterna proved to be a natural successor. The Master Chorale’s music director, Paul Salamunovich, loved Gregorian chant and he built his chorale forces from the bottom up, with men’s sections that produced particularly rich, deep sound; both factors have been clearly in evidence throughout the past 20 years. The ensemble that Gershon has built is a more flexible force, even with 132 singers on the stage. Gershon emphasizes diction and projecting the meaning of texts and the Chorale has a somewhat leaner sound than was apparent under his predecssor. All of that was clearly in evidence Saturday as Gershon led Lux Aeterna’s first performance with choir and orchestra in Disney Hall — he had programmed the organ/choral version for the ensemble’s 50th anniversary season. Gershon led an unhurried performance but one that never lost the sense of line. The Chorale sang as a marvelously flexible unit throughout, but particularly in O Nata Lux, which is the work’s central point both literally and figuratively. Even with Lux Aeterna’s hushed ending, the performance brought forth an instantaneous standing ovation from the near-capacity crowd, applause which reached its apex when Lauridsen came on stage to join Gershon, the chorus and orchestra for the celebration. I wished I had been singing. • Although this concert represented the formal ending of the Master Chorale’s season (the performance tonight is part of a gala dinner honoring Lauridsen) and Thursday’s performance is the closing performance at the Chorus America national conference taking place in Los Angeles.